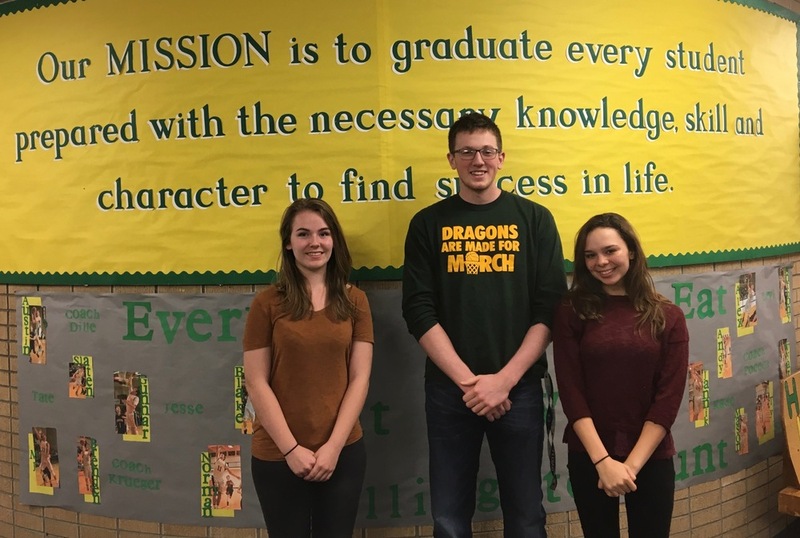 Seniors, Austin Herman, Kayla Marshall, and Morgan Phillips received word on 23 March 2017 that they had received scholarships that would cover the cost of their undergraduate studies. Herman was awarded the Boettcher Scholarship and Marshall and Phillips were awarded the Daniels Scholarship. "The last student from Holyoke to receive the Boettcher was in 2011 and we have never had two Daniels winners in the same year before," said Susan Ortner as she celebrated the news with staff. According to the Boettcher Scholarship Website, "Our merit-based scholarships for Colorado high school seniors provide what is essentially a full-ride to any four-year institution in Colorado. But the Boettcher Scholarship is about much more than financial support. We provide our scholars with unique opportunities to enhance their time in college, access to a broad network of successful alumni, and additional grants and experiences to jumpstart both their future careers and their leadership potential" (http://boettcherfoundation.org/colorado-scholarships/). Herman has narrowed his choice to The University of Colorado at Boulder or Colorado State University in Fort Collins. The Daniels Scholarship is just as beneficial to the recipient but less restrictive to where recipients attend. According to their Website, "The Daniels Scholarship is an exciting and challenging program that provides the opportunity to obtain a four-year college education at any accredited nonprofit college or university in the United States, complete with financial and personal support throughout the journey. The Daniels Scholarship Program offers resources, encouragement, and inspiration far beyond the financial assistance needed to earn a college degree. Our goal is not only to help Daniels Scholars succeed in college, but to ensure that they thrive beyond their years in college" (http://www.danielsfund.org/Scholarships/). Neither Marshall nor Phillips have decided where they will go to school however, Marshall wants to stay in Colorado and Phillips wants to study in another state. This is an exciting time as for these seniors and all of them as news starts to pour in about college acceptance and scholarships and grants to help them pave the way of the future.